Photos by Willbur Pippin for Harper's Bazaar, February 1973. Here, photographed in the rooms where they entertain, are the women who give the parties everyone wants to come too… ones where the various worlds that pass through New York meet. Each of these women has her own crosscurrents of friends, her own special ways of doing things, which she talks about on these pages —the how, why, what, and when that made her parties such good ones. Interestingly enough, there is one thing all five hostesses have in common: they like wearing caftans at their parties. 8:30—thirty dinner guests arriving at any minute. And thirty or forty more coming in after dinner. Ahmet Ertegün’s business, as head of Atlantic Records, and Mica’s decorating firm (MAC II) mean that parties bring together people of all different places, interests, ages: art… music… London… California… New York… top drawer… other drawers. Mica feels good food is very important: “Usually an artichoke with a lemon sauce to start with —I’ve a Turkish cook and it’s something you don’t get other places.” Coffee is served upstairs and down. For people still deep in talk, the dining room. For other, the living room (above), which is superb and runs the length of the house. The Clifford Still behind Mica is new. The Magritte, which was there before, has moved down to the dining room. “People look prettier in less light,” Mica finds, so she only has lights on the paintings, canister lights in the four corners, some candles. In the dining room, too: the paintings lit, lots of small candles on the three round tables, no other lights. “I’ve come to the conclusion,” says Mica, “no music when you come in. People like to talk. Then as the evening goes, so goes the music. Often until 2:00 a.m.” Everything is very relaxed about Mica’s parties, just as Mica herself is in her caftans which she wears over black satin trousers or white silk ones. And here, with a bone necklace she picked up in a Turkish bazaar and had mounted in gold. Wool challis caftan, Halston. 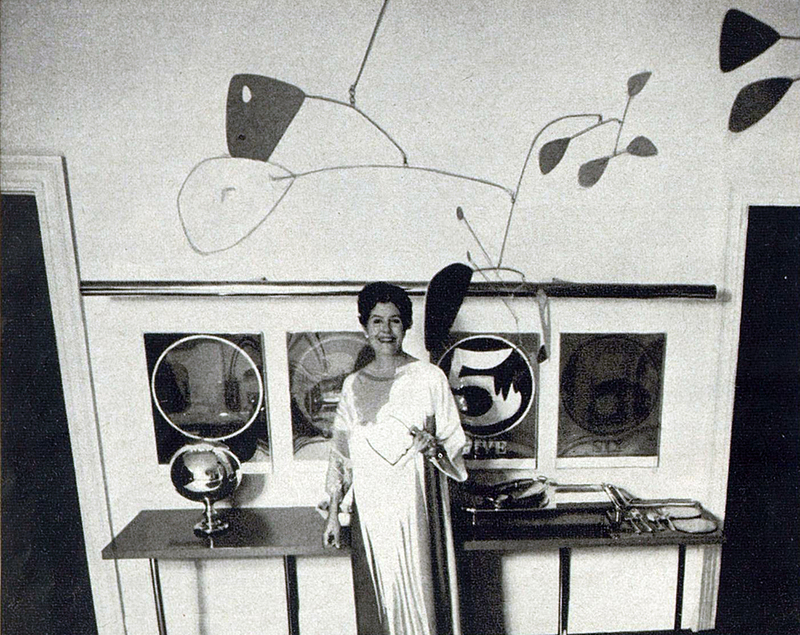 Lily Auchincloss is photographed in her dining room, above, a superb room combining modern art and architecture in a fresh lively way. “I’ve never had an interior decorator but I’ve always worked with architects.” Paul Lester Weiner designed her red lacquer table. Marcel Breuer, her chairs. Above, where you’d expect a chandelier—a red Calder mobile. And framed prints by Robert Indiana running the length of the lacquer-red sideboard from which Lily serves her dinners. “I think six is the perfect number.’ Lily adores good food. She likes to cook it, arrange it and serve it. Often with an Oriental dash: the Japanese-fresh way she does salads of endive, mushroom, basil, raw zucchini, rugola… February strawberries, big ones still on stems, sitting on leaves in individual baskets, each with its own dish of sugar… ginger for the coffee. In other rooms, spring flowers all winter. But never in the dining room—it has none and needs none. Even the caftan Lily’s wearing here like a piece of modern art, in bright blue, red, green, yellow, and white silk. By Halston. Dinner parties at the Gardner Cowles’ begin in the uniquely beautiful living room, above. Windows recessed and shuttered in mirror reflect steeples, domes, and rooftops below and a long sweep of the Central Park skyline… Frank Stella’s huge painting is rainbowed across lacquered walls… fuchsia pillows sharpen a geometry of pale banquettes… Plans start weeks ahead, organized in one of Jan Cowles’ pink folders—“they’re fast and the fact they are bright pink is very nice.” Clipped to it is her check list: how much extra help… when to order flowers, etc. Two days before, she goes over the menu with the cook. “She speaks French. I don’t. So we have a lovely time.” Final plans are in triplicate—for Mr. Cowles’ office, the staff, the files. Eighteen guests are invited for 8:00, and dinner is at 8:30. Afterward, talk goes on in the library and the living room, with a good blaze in both fireplaces—especially when it snows. “I never think of what I’ll wear until the last minute.” But Jan Cowles loves caftans. “A hostess must move a lot, must be comfortable.” This one’s by Bill Blass. “Ten people who have something to say. Ten people you want to listen to.” That, to internationally known dress designer Mollie Parnis Livingston, is a good dinner party. “And I don’t let them off easily because everyone’s interested, and important people like to talk about what they do. If you’re lucky, at my house, you might meet a member of the Johnson family… very, very lucky, the President himself… or Mr. Kissinger.” Guests are asked for 7:45, usually there by 8:00. Dinner is at 8:45, beginning with crudités in the living room, a lovely feminine room warmed by strawberry-silk curtains and two of Mollie’s splendid paintings—a Picasso, and the Matisse above the coffee-silk sofa. In the dining room, guests are seated at one round table, with violets, small candles in the center. “Often we have coffee at the table; if the conversation is really going you don’t want to break it up. By 11:30, most people are ready to leave—and I’m ready, too… I’ve had a good time.” This year, Mollie always wears caftans at her parties: “They do everything for you and they’re so easy.” This lovely one in robin’s-egg-blue crepe is her own design.